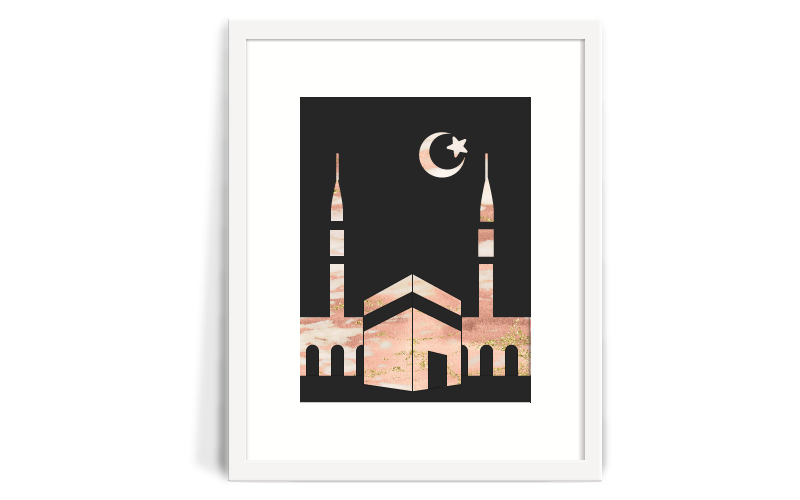 Marble Masjid print with gorgeous pink and gold glitter. - 300 dpi (resolution, highest quality). - You can print as many as you like for yourself, or as a gift! **** PLEASE NOTE: These are digital prints ONLY meaning you will receive the files to download which you will print or have printed yourself. Nothing physical will be mailed. - Colors on a monitor may vary slightly from how they appear in person or how they display on one viewing device from another due to the color calibration of your device or monitor. The printing depends of the quality of: the paper, monitor, or printer. - I recommend printing the wall art using a high quality printer, such as a laser jet or commercial printer, at your local office supply store or printing service for highest quality results. - This is a digital print only, nothing will be mailed. Once payment has been confirmed you will have the opportunity to download your files. You can then take these files to your local printer or have prints ordered from your favorite shop online. - Though you may print as much as you like for personal, you are not permitted to resell the artwork (for any commercial use) or recreate the print using the quote, text or graphics.